« Remember When I Said It Was All About the Mix? Its hard to climb the ladder if your not allowed to get on the ladder. 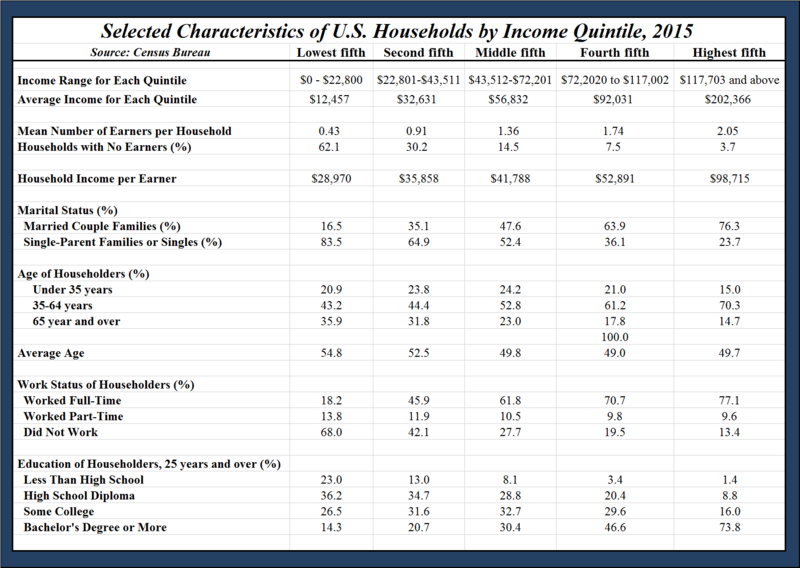 Wouldn't raising poorest quintile to second raise earnings $35,858-$28,970 = $6,888 ? It would raise the poorest quintile by $6888 per earner, but the poorest quintile only has 0.43 earners per household. Thus, the household income gain is only $6888 * 0.43 = $2962. I'd like a tool or an argument that will convince 51% of voters in Arizona in the November general election. I don't think that chart is going to do the trick. Send the wife out to work, and then both work longer? Thought that happened already, with effects on marriage, family and health. What about the Ford approach - give them more money and they'll spend more, including on your own products. The number of people who believe that tripe about Ford still has the power to surprise me. Ford raised pay because he was fed up with the training costs and lowered productivity caused by high labour turnover. An average number of earners in a household = 2.05 is odd. Does anyone have an explanation? This can include children who work. So a family owns a restaurant and the son or daughter busses tables some nights and on the weekends. Or an adult child moves back in with the parents but is employed and contributes to household expenses. When you are young, the first thing an employer asks is about prior employment. Doesn't much matter what it was. They want to know did you show up, did you get fired, could you sell burgers competently? Raising the min wage reduces the chances of kids getting that first job. There are also times when someone is desperate--they lost their job and need something. Some job at low wage is better than no job at the min wage. It is a sad statement on the achievements of our educational system -- or lack of achievement -- that so few people have the data and analytical ability to understand how raising minimum wage hurts the poor. I will not repeat various arguments here, but quickly note that 91% of minimum wage earners do not contribute to the family budget -- in other words, they are teens. Most of the minimum wage increase $ goes to middle and upper class families where minimum wage neither affects employment opportunities nor commitment to education and extra curricular activities. HOWEVER, that does not mean that we do not care about the poor. Even though minimum wage is a bad idea, we want to help parents who are trying to care for dependents. A much better way -- and a much more focused approach -- is the EITC concept that was advocated by Nixon (!) and effectively implemented by Reagan. If a person is working and supporting a family but not earning a "living" wage, let's give them money through tax credit. Let us reward people for doing the right thing, not hurt the poor through unintended consequences. It's a lovely dream, isn't it? Yes, we can pull ourselves up by our own bootstraps, by spending our way to prosperity. No one has to do more, or do things better. More consumption should not be linked in any way to more production, such as working more or working longer. No thanks! No, we just spend, and the magic mystic multiplier creates a sort of perpetual motion machine. How progressive! Let's say you raise minimum wage 10% to help The Downtrodden Masses. David Neumark's massive survey of minimum wage research would tell you this puts somewhere between 1% and 2% of the people you were trying to help out of work. So, 98% get a 10% raise, or 9.8%+ 2% get a 100% cut or 2%-. Net effect = 7.8% more money to minimum wage earners. "Hurray! Vote for the wonderful Democrats that gave us such a nice wage increase!" ...but what about the poor sad people that are out of work that get 0 now? They don't get 0. They get unemployment. They get food stamps. Because of welfare, do they really fall that far from where they were at minimum wage levels? They are now 100% dependent on welfare. "Oh no! Vote against the evil Republicans that would take away our Welfare checks!" On balance, for the people earning minimum wage and the Democrats who love them, doesn't an increase seem like a very positive thing? ...at least until you account for the inevitable price increases. Bottom line, welfare attenuates the benefits a little and the costs a lot. First, the benefits and costs are close in magnitude only if we assume that people don't care whether they have a job or simply a welfare check. Do we have evidence of that? More importantly, your comparison is static, and it doesn't look at the distribution of who loses their job versus who gets paid a bit more. The people who keep their jobs and get a raise are likely to disproportionately be young people in middle class homes who are not contributing to the household budget. The people who lose their jobs or never get jobs to begin with are likely to be disproportionately minorities in poor homes. Don't Progressives care about disparate impact on minorities? More importantly, if you lock a kid out of the job market for the first few years of his adult life, how does he ever get in? And what does he do in the meantime? If he had been allowed to get a start, perhaps he would have learned skills (such as showing up on time and being respectful) that would let him 'climb the ladder', getting better and better jobs and more choices over the course of his lifetime. Instead, by knocking out the bottom rungs, he may be shut out of the legal job market for his entire life, able to hope for nothing better than selling loosies or CDs illegally on the sidewalk. The numbers don't balance nearly as well when we adjust for the selection bias (which people are likely to lose their jobs) and on the long term effects. Yeah, that's pretty much my point, Ann. You have to get into the second-order effects to make the case. It's not a one easy chart kind of issue. What you're saying about which people lose is exactly what I mean when I say, "distribution of minimum wage earners across the income quintiles." Thanks. That's really the only explanation, but I wanted to make sure I was not missing something. Thanks...I just wanted to make sure I was not missing something. loosies or CDs illegally on the sidewalk." I actually witnessed this scenario. A sort-of friend at the time lived with friends I had to move in with due to a hardship at the time and take his place because he only ever held one job that he ended up losing. As far as I know he's still jobless and its been over a few years because he's so unskilled that nobody will hire him except for a few temp agencies to jobs he has no mode of transportation to get to. Without any income he's stuck pursuing a life of immersion on the computer, living with one of his parents. He's now in his late 20s in age. I'm pretty sure we don't want to be pursuing policies that lower labor supply. A high minimum wage is exactly that kind of policy. As ford Ford's labor policy, as kidmugsy notes it was primarily an experiment to try to reduce labor turnover on his assembly lines. What people often fail to note about it is the conditions that Ford imposed on the workers who accepted it. Ford had a strict moral code of conduct, forbidding drinking and gambling, and requiring regular church attendance. Most workers today would bristle at the thought of their employer attempting to assert that much control over their private lives. The $5/day policy failed largely for that reason. Also, after the onset of the Depression, Ford's labor relations became far more strained and he came to be known as one of the foremost union busters in the US. Can of worms - what led to the Depression? And low pay, unemployment and underemployment have many expensive knock-on effects. Golly this discussion could ramify, but unfortunately I've got work to do. A major problem with minimum wage increases is that they are essentially irreversible as policy. In principle it is possible to repeal a minimum wage law after passage, yet I've never seen it happen in practice. This "ratchet effect" is what makes it problematic for those who are on the losing end -- those priced out of the labor market. They have no recourse. They may be able to receive unemployment benefits after losing their job, but these benefits are temporary and provide only a fraction of the income they were receiving while working. In contrast, the effect of the wage floor increase is permanent. If their labor is worth $12/hour to prospective employers, they won't be hired if the minimum is $15/hour and that effect does not attenuate over time. Which brings me to my other point. Those who support a high minimum wage (most on the political left) have taken to claiming (incorrectly in my opinion) that the empirical evidence from studies of minimum wage increases on average show little or no effect on employment outcomes. First of all, this isn't really true. Secondly, even if it were it would still not be a guide to the likely effects of a large minimum wage increase, like the $15/hour proposals that have been floated in a number of cities and even passed in a couple of them. The dramatic increases they imply fall outside the sample range for virtually all of the empirical studies of minimum wage increases to date. That's a dangerous gamble with the livelihoods of a lot of workers. The Great Depression was one that was driven by excess credit that led to a malinvestment in all sorts of areas in the economy but its beginning was months before the Stock Market Crash, it actually started in 1928 when banks started to call on loans due and stopped lending because the excessive credit was bringing excessive risk. The credit available for industry and commerce slowed putting pressure on earnings that were paid in cash instead of easy credit. Productivity was still increasing at this point but when the banks started to call and curtailed lending to speculative investors, the rug came out of the works and the stock market crashed causing the companies that normally did well on issuing stock, found them holding a bag of unwanted shares because investors for the most part had dumped them in order to satisfy their creditors. This caused the balance sheets of all sorts of business to go haywire in the months following and widespread bankruptcies took years to resolve the bad debt that creditors had issued. The Great Recession is a repeat of this caused mostly on malinvestment in the property market (commercial and house) sector, mostly driven by well intended but bad public policy, particularly in increasing the risk in subprime lending. To add to it the banks decided they could reduce their risk by bundling mortgages together into a special investment product where the actual liability of the loan was held by a third party but the bank acted as the middle man where the bank took its share for processing the loan payments and remitted the rest as income to the holder of the loan. In late 2007 this type of investment device had become supersaturated in the market and with it had also ballooned in subprime risk as banks tried to offer loans to more and more those in the subprime bracket often with very attractive terms that could only be met by steady and stable rises in income levels. When the signs that these subprime mortgages were getting too risky banks started to cut them off but competitive pressure cause others assume more of this risk. The wheels started to come off when banks started adjusting their interest rates for subprime mortgages and subprime debtors found themselves having to pay more and more as their interest rates adjusted and they started defaulting in greater numbers. The subprime mortgages bundled into investment devices started to dwindle in income to the investors and the ability for the banks to offload the liability collapsed causing the banks to then take on loads of bad debt. This caused shocks across the banking system as property values collapsed in response to unsold bank default inventory.